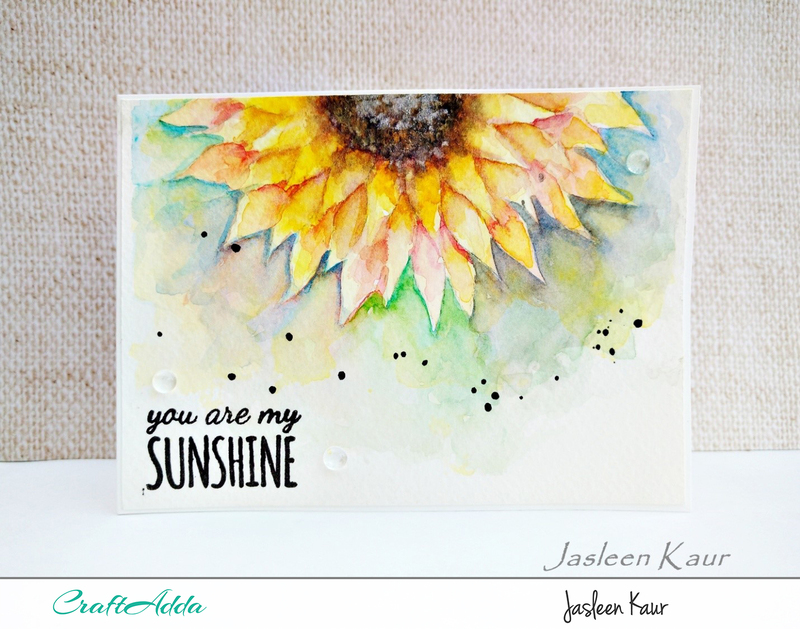 This is Jasleen, back with my guest designer post for this month. 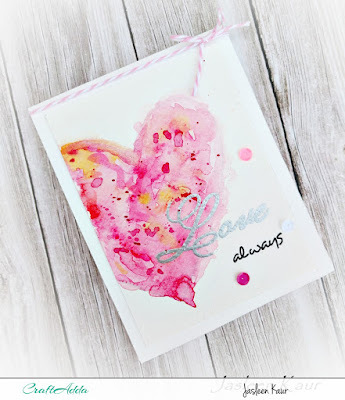 And Valentine’s Day being just around the corner, I thought of sharing a few love –themed card ideas using a couple of stamp sets by CrafTangles the team sent me- one is ‘Love is in the Air’ and another one is ‘Always Yours’. Attempted some free hand water colouring for the first time. I used Gansai Tambi water colours here. 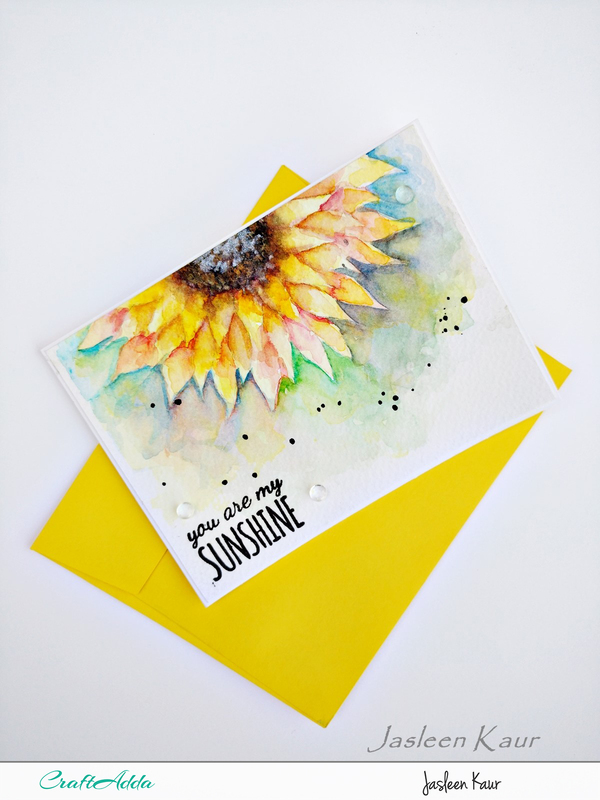 The sentiment ‘you are my sunshine ‘ from ‘Always Yours’ set goes perfectly well with this image. I started by lightly drawing a heart shape along the edge of a 4 by 5 inches Brustro water colour paper, using a pencil. Then I added a water colour wash using Gansai Tambi in different shades of pink, trying to confine the colours within the pencil drawing. After letting it dry, I stamped the sentiment ‘LOVE’ from ‘Love is in the Air’ set using Versamark Ink. I heat embossed it using silver embossing powder, and stamped ‘always’ in versafine onyx black ink. I mounted this panel over a standard sized card base and finished off using some sequins and a Baker’s twine. 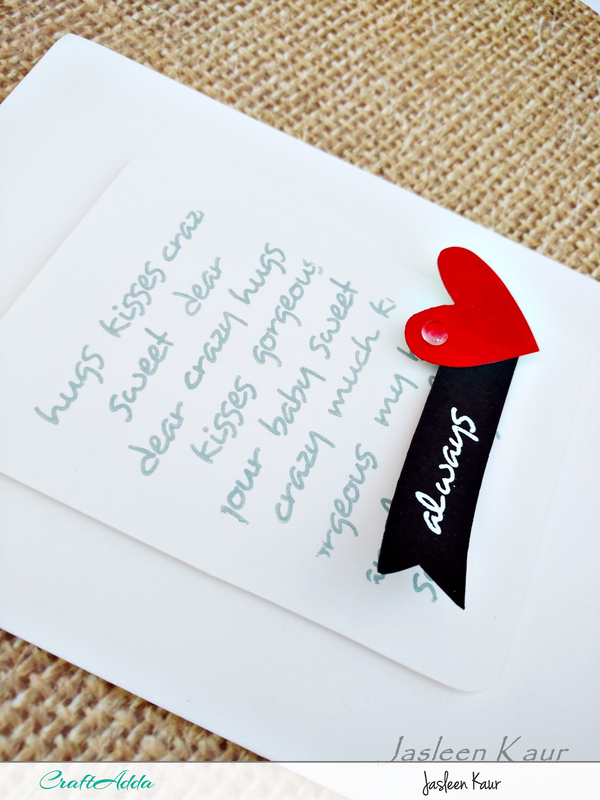 This one’s a clean and simple card that uses multiple sentiments from the ‘Love is in the air’ stamp set and that die cut heart is from Sizzix Bigz-Heartfelt set. The sentiments on the white card base were stamped using Memento ink-London fog, whereas the one on the black strip was heat embossed in white. Lovely watercoloring Jasleen... It's a treat to the eyes. Wonderful cards Jasleen ! I am totally in loved with the free hand drawn sunflowers and tbe watercolors look fab ! Just beautiful Jasleen! You have outdone yourself! Thank you, friends. Your comments made my day.